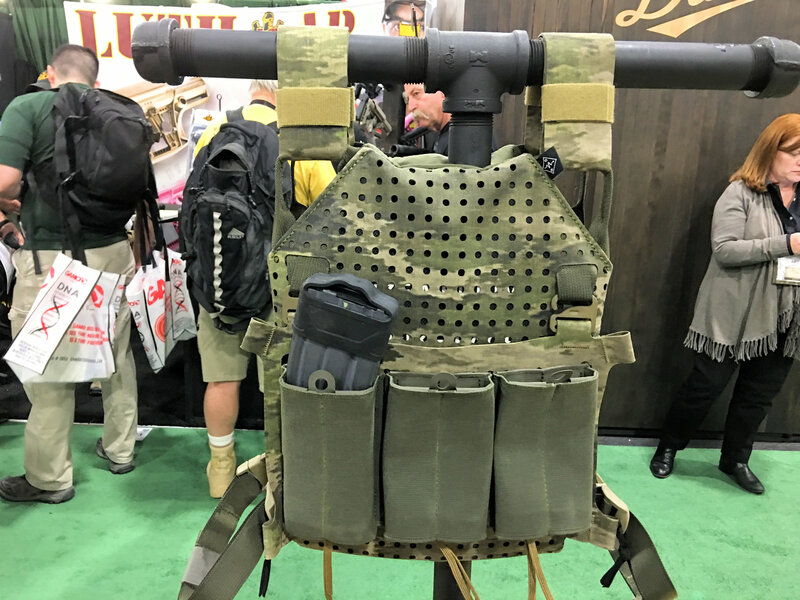 Snake Eater Tactical SET Rifle Armor Plate Carrier with Patent-Pending Grid Mounting System and Burro Mag (Magazine) Pouch Rack: Ultra-Minimalist, Modular Lo-Pro/Lo-Vis Plate Carrier in A-TACS Camo Combat Camouflag Pattern for Clandestine/Covert Special Ops! (Video!) | DefenseReview.com (DR): An online tactical technology and military defense technology magazine with particular focus on the latest and greatest tactical firearms news (tactical gun news), tactical gear news and tactical shooting news. 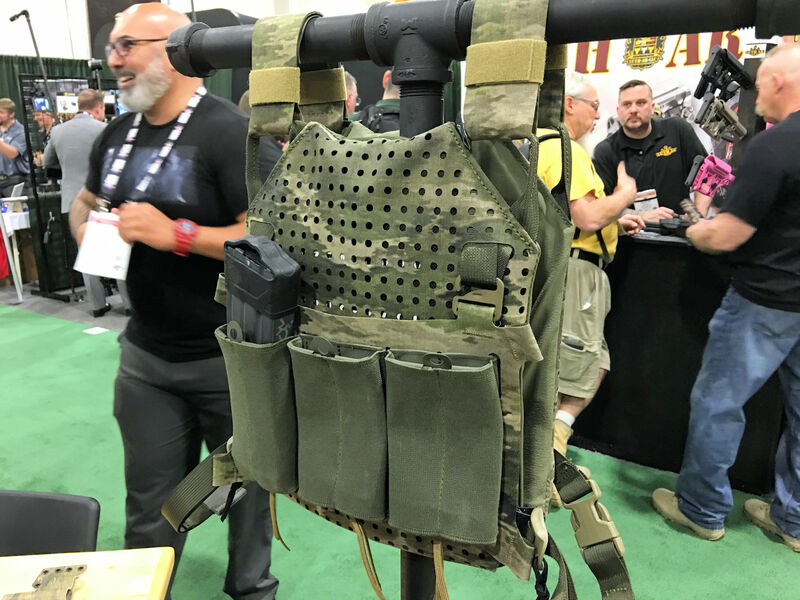 As DefenseReview (DR) was making its annual stop at the https://www.a-tacs.com/ target=right>A-TACS Camo combat camouflage booth, we came across a very interesting and nice looking ultra-minimalist, modular lo-vis/lo-pro (low-visibility/low-profile) tactical rifle armor plate carrier made by Snake Eater Tactical (SET) that was on display there. 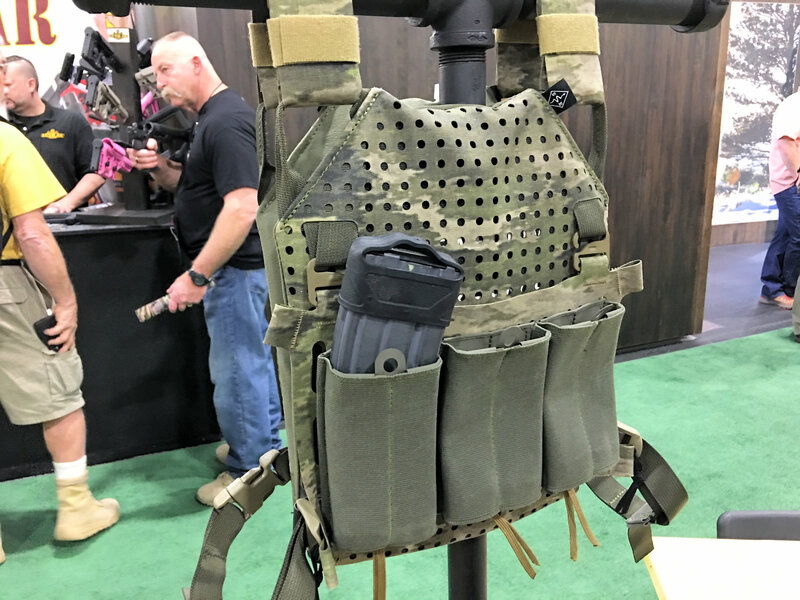 The plate carrier’s designer, one Chris Calvert, was kind enough to take DR through the system, and he started with the Rifle Plate Carrier’s proprietary and patent-pending Grid Mounting System (GMS). 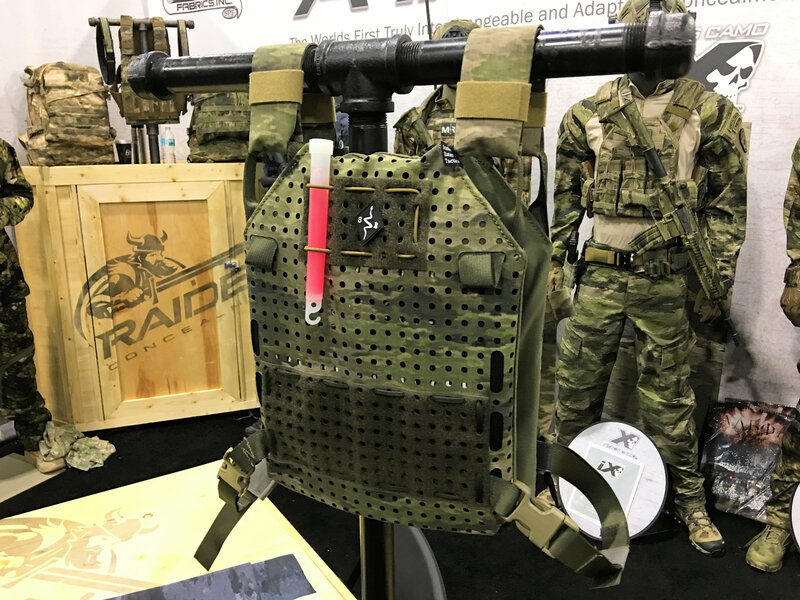 The Grid allows the operator/wearer to mount any PALS/MOLLE pouch with 550 paracord, shoe laces or zip ties, “and the advantage is you can mount any MOLLE pouch, verticle, horizontal, or at a 45-degree angle, and you can move it up and down, left and right in half-inch increments, as opposed to the traditional MOLLE system, where you’re stuck in a inch-and-a-half (1.5″) by one-inch (1″) grid, [where] you can’t mount stuff [horizontally],” says Calvert. DR immediately liked the Grid mounting system in both functionality and aesthetics. We also liked the shoulder strap loops for maximum flexibility, comfort and strength. And that’s not all, Monty. “We have Velcro panels that you can lace on. You can put ’em on wherever you want. You can do stuff with shot cord. The system is basically designed to be modular, and limited only by your imagination. So, we encourage the end-user to get creative with it,” Calvert told us. That’s when Calvert showed us an Snake Eater Tactical SET Burro Rifle Mag (Magazine) Pouch mounted in a removable rack of three Burro Rifle Mag Pouches that mounts right onto the Grid, and can also be used as a stand-alone chest rig with a harness. So, everything’s modular, including the accessories/components. 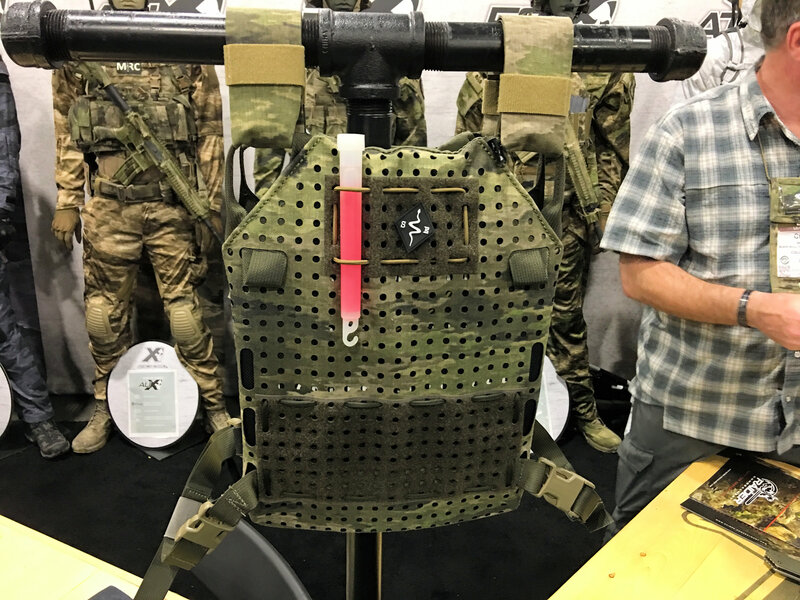 The SET Rifle Plate Carrier looked particularly good in the A-TACS Camo combat camouflage pattern we saw it in, although we’re not quit sure which one it is. We’ll try to find out ASAP. All in all, the Snake Eater Tactical SET Rifle Plate Carrier is one of the nicest and most intelligently designed minimalist, lo-pro/lo-vis plate carriers DR’s seen in a while, and we’re interested in how it would stack up against the Velocity Systems Scarab DLX plate carrier, which looks a bit larger and more complex, but is also a nice carrier. The SET Rifle Plate Carrier is actually closer to the S&S Precision Plate Frame in design concept and size, so we’d like to see a side-by-side against that carrier, as well, particularly with regard to comfort and ease of accessory mounting and unmounting. 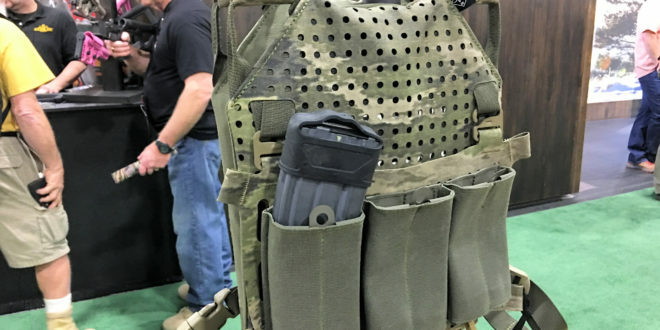 Defense Review would LOVE to get a SET Rifle Plate Carrier into DR writer/contributor and chief new-product tester Jeff Gurwitch’s hands for some serious T&E (Test and Evaluation), and maybe even a detailed written review, at some point. In the meantime, enjoy the video we shot, below. Next: Will the Russian Air Force Beat the US Air Force to the Punch with 6th-Gen Jet Fighter Aircraft-Mounted Laser Weapons, Radio-Photonic Radar (‘Radio Vision’), Microwave Weapons and Guided Electronic Munitions? Let’s Hope Not.